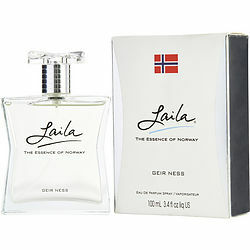 Laila Perfume by Geir Ness is the soft and girly fragrance that is perfect for women of any age. Introduced in 1995, this refreshing floral scent is casual and alluring. The delicate mountain wildflower notes are combined with natural oils to create a clean and fresh scent that invites compliments. Juicy watermelon adds the right amount of sweetness and makes this an excellent perfume for daily wear. Spray it on before leaving home and get noticed wherever you go. I was first introduced to this scent when we went to Disney World and was in Norway. The scent lured us into the store and my husband purchased it for me. I love this scent, it has an alluring seduction and a joyful aroma. I have worn Laila for as long as it's been in existence, 20 plus years. I too have a lot of people asking me what I'm wearing. Men in particular seem to love the soft scent of Laila. I love it!!! I bought the Laila Parfum and I loved it thank you! I put it on daily love the fragrance and lasts long time!